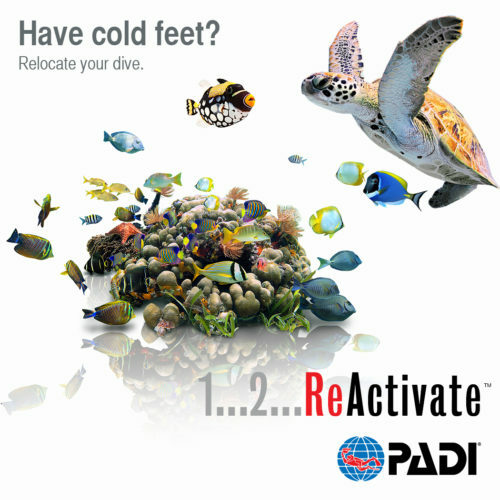 The ReActivate™ program is the perfect way to update your dive skills and knowledge from the PADI Open Water Diver Course before jumping back into the water. Whether you want a few reminders or need to go over the basics, ReActivate is personalized for you: You conveniently review scuba concepts on your tablet, mobile device or computer, then go diving with a PADI Professional. It’s quick and easy, and a good way to prepare for your next PADI course or get ready for a diving vacation. The best part is, divers who complete both the knowledge and in-water skill refresher receive a replacement certification card with a ReActivated date on it. Bring your completed eLearning Completion Printout to show your instructor your work. In the water, your Seaweed Diver PADI Professional will help you regain comfort and confidence in scuba diving. You’ll practice a few safety-related skills and then go over anything you specifically want to review. You’ll use basic scuba gear including a mask, snorkel, fins, regulator, BCD and a scuba tank. The exposure protection you need will depend on whether you dive in a pool, confined water or open water dive site. Your Seaweed Diver staff will explain other equipment you may need to ReActivate.